Multi-channel selling presents many challenges to sales and marketing managers and strategists. It also makes life difficult for some back-office operations. Finance, product management and engineering find themselves confronted by problems coming out of a complicated and diverse distribution network, and regulatory compliance managers are bewildered by the application of a product to mitigate some unfamiliar issue with a particular customer from an obscure market segment. Managers are asking questions like: Is the company exposed? Could the customer sue for fraud if the product fails or makes things worse? Why do these guys get such a huge discount? Isn’t this sale encroaching on another seller’s territory? The more complex your product is, the more variation you have in terms of deliverable configurations and aftermarket support. And, the more diverse and numerous your sales channels, the more likely you are to encounter some or all of these problems. The good news is there is technology available that helps to close those knowledge gaps in terms of who is selling what to whom, what the product is doing for the customer and what the correct pricing is for the sale. That technology is found in a robust CPQ solution. How Does CPQ Software Help Manage Multi-Channel Selling? The name says it all. CPQ is made up of three technological elements: configuration software, pricing calculation automation and proposal generation technology. We will examine each of these elements separately to see how they can aid the user in effectively managing diverse sales channels collectively and individually as needed. Many companies build products that are designed to satisfy multiple needs. A metering assembly may offer measurement capabilities for any powdered substance used in an industrial process. For instance, the basic product might measure flour used in a commercial bakery that produces thousands of loaves of bread per day. It might also be used by an ammunition manufacturer to meter the correct amount of gunpowder used in a single round of ammo. Beyond the use of a powder substance in their making processes, bakers and ammunition producers have very little in common. Both expect accurate and reliable metering of the powder substance used, but the end-products—bullets versus bread—are about as different as can be. The selling of those products, the buying audience and the running of the two types of business are also wholly different from one another. As a maker of these metering assemblies, you have to understand the challenges and needs of both bakers and bullet makers. Your engineers have to know what configurations of the metering assembly are acceptable for food applications and what ones aren’t. They have to know that metering gunpowder may be handled by a very small and precise unit of measure while bakery flour might be measured by volume with considerable latitude per batch. CPQ, and especially the configuration element within CPQ, ensures that the sales rep will properly select the right parts and assemblies to address with the gunpowder or bakery markets as required. Scripts built into the configuration process prompt questions that select or eliminate certain products, parts and assemblies as appropriate to the answers given by the customer. The software does the work, it possesses the knowledge required and asks the questions needed to address either market. The sales rep is not saddled with a training requirement involving lots of esoteric technical knowledge. Selling products through multiple distributors by market segment or geographical territory offers the challenge of making sure the pricing requirements for each individual market are addressed properly. This is critical for any product but especially for those products with prices based on value delivered. Cost-based pricing is in many ways easier to administer. The product costs you X dollars to deliver, and you want to make Y dollars over each sale. X+Y equals your price. But imagine a sales channel that can realistically sell 50,000 copies of your product in a single year. Compare that with another channel that will only sell 500 copies per year. Think about your operation in South America. Your widget is selling for 10 bucks a copy in the States, but your competitors are getting 30 bucks a copy for similar products in Brazil. You have national accounts and GSA-qualified customers that can buy off specially discounted price lists. How do your various sales channels handle these pricing variations? The answer is CPQ. 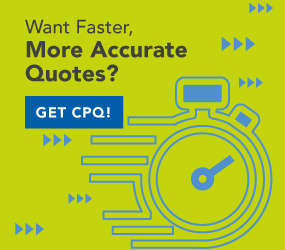 CPQ delivers the right price to each sales rep and customer. Again, the basic information collected during the selling interview process narrows down the price-list choices that are available for the individual sale. Your sales rep in Brazil doesn’t even need to know about US GSA pricing because they have no customers in Brazil that qualify for GSA discounts. The software takes care of all that for you. How much does it cost? That is the question that comes up at the beginning, during the middle and at the end of every sales engagement. The buyer may want a “ballpark” quote, or they may want a best and final offer. The quote may be the only price quoted, or it may be one of 30 prices quoted over time. The buyer may want a complete and highly detailed proposal along with a line-by-line price to serve as an entry in a highly competitive bid response. The actual output produced might be a part number with a single price, or it might be an exploded bill of material with line-item pricing and rollups for the entire offer. A number is typically only one part of what goes into answering the “how much is it” question. In most situations for products that involve significant cost, a proposal is more often what is needed. The proposal expands on the numeric data involved and gets into extended detail. Proposals include confirmation of what the customer needs, summaries of alternatives explored, delivery requirements, training and implementation requirements, customer references for similar purchases and finally, the product data and pricing for the recommended solution. The ability to produce this information, tailored to a specific market in a timely fashion, is essential. CPQ will accomplish this for your sales force and customers. Most importantly, it creates a historical record—a timestamped price quote with specifics in terms of what was and was not included in the price. CPQ not only makes things easier and benefits Sales and customers, it also delivers great advantages to managers in the back office and those wrestling with the complexities of a multi-channel sales force. CPQ allows you to treat each distribution channel as a unique entity and also to see the selling process from a unified perspective on your end. If you manage multi-channel selling channels, your life will be easier with CPQ software.